STEP 1: Make sure the unit is connected and turned on. Also, the printer driver PKG file must be installed. Either run the driver PKG file from the install disc or download it from our driver downloads area. If you are updating an already added printer, STOP NOW. Step 2 is not necessary. The driver has been updated. Verify the update was successful by using the information in this article. 1. Go to Hard Drive - Applications - Utilities - Print Center. 3.Click on the printer when it appears in the list. 4. 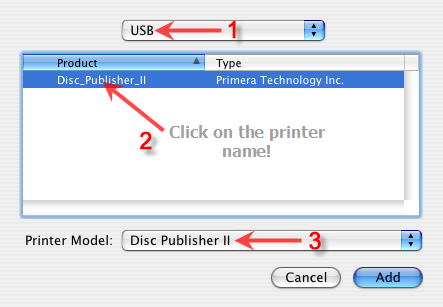 Make sure the printer type is set to USB and the Printer Model matches the printer name. 5. Click Add. The printer will now appear in the Print Center. 1. Go to Hard Drive - Applications - Utilities - Printer Setup Utility. 5. Click Add. The printer will now appear in the Print Setup Utility. 4. Make sure the "Print Using" matches the printer name. 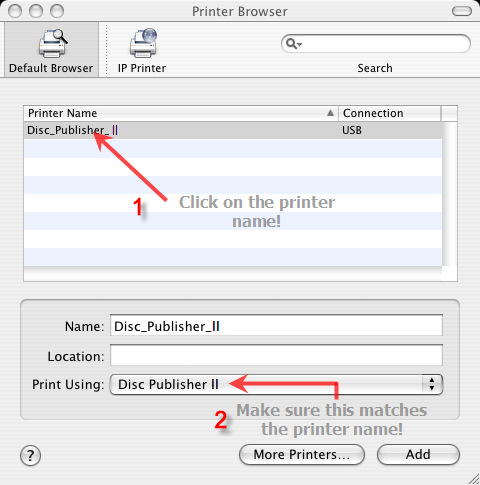 If you have installed the Printer driver according to STEP 1 above, the printer should automatically add itself to your printer list as soon as the USB cable is connected. If the USB was already connected while you were installing the printer driver, simply unplug it and plug it back in to get the Mac to find the printer and automatically add it. If it does not add, or if you would like to verify it was added properly, follow these steps. 1. 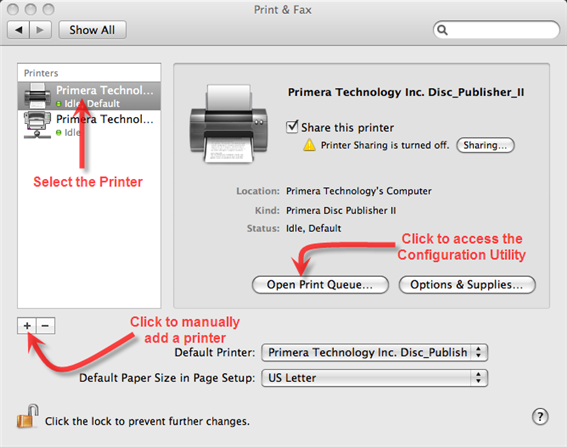 Go to the Apple - System Preferences - Choose Print and Fax. 2. The screen below will appear. Added printers will appear on the list on the left. If you do not see your printer on the list, click the plus to manually add the printer. To find out more about that printer, select it. To open the Print Queue click the button indicated. Opening the print queue will allow you to access the configuration utility button, which will allow you to view ink levels and perform maintenance. 2. Clicking the plus will open the add printer window. (1) Check to make sure the default button is selected. That will show you all connected printers. 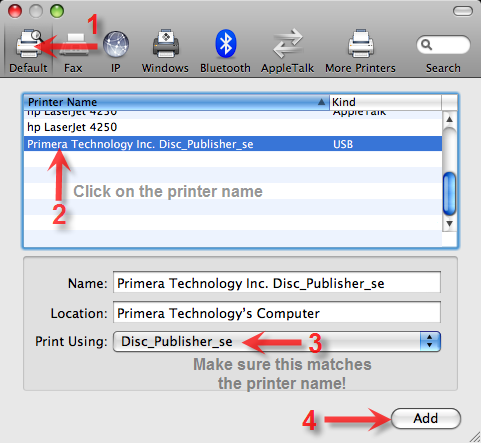 (2) If the printer is connected and recognized by the Mac it will appear on the list. Select it. (3) Make sure Print Using matches the printer name. (4) Click Add.